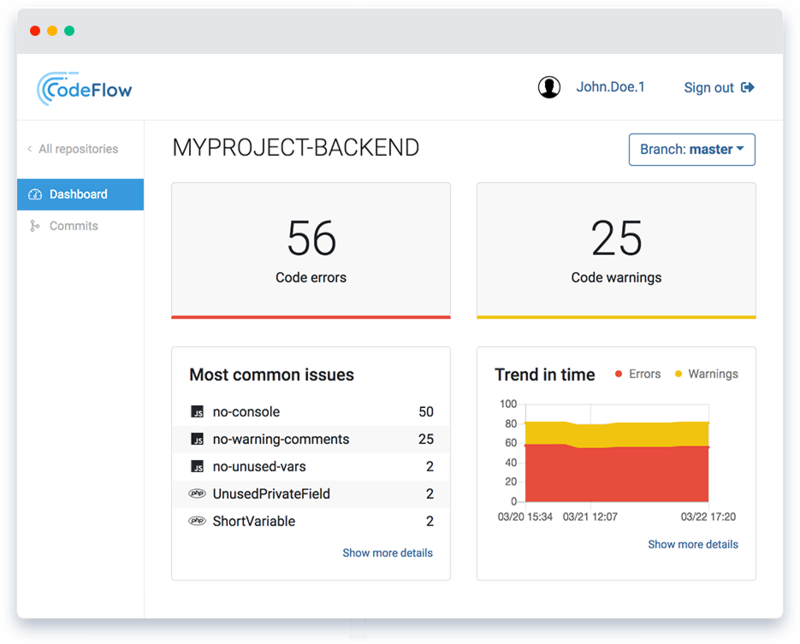 Trying out CodeFlow is easy. All you have to do is register an account. How can you do that? First, go to our website, fill in your email details and click “Get Started” button. GIT server: We support Github, Bitbucket and GitLab. Repository Access: You need admin privileges to be able to add your repository to CodeFlow the first time. We need to register a webhook on your repository to support all the features. After the repo is added, anyone with read privileges can access it. Assuming you are logged in with your Bitbucket or GitLab account, you are presented with a list of your repositories. If not, click refresh button on the right side. After finding your repository, click on it, and register the webhook. Your repository is now imported, and a first analysis will begin. When you have added your projects, you should see a simple dashboard with your first report.